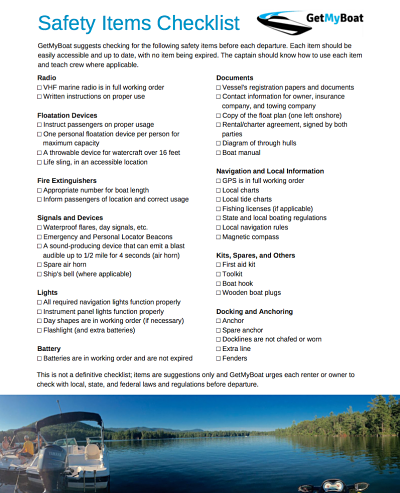 GetMyBoat provides a downloadable Safety Items Checklist. Each owner should have a copy to review while at the boat, and each renter should have a copy before and during the rental. This checklist serves as a reminder to check the required and suggested safety equipment; to make sure the equipment and items are running properly and are not expired; to showcase where each item is located; and to allow the captain to inform passengers of necessary items' locations and their proper usage. If the vessel is missing a safety item that is required by law or if the item is not functioning properly, do not go out. Have the item replaced or fixed as soon as possible. If a suggested safety item is missing or not functioning properly, assess the situation based on safety. When in doubt, let safety prevail: stay on shore. Check the list before each departure and after each return to ensure all items have remained on board and continue to function properly. Always check with local, state, and federal laws and regulations before you go out.